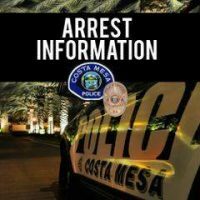 Jasmine Swaine, 26, Costa Mesa, for a parole violation. The parole/probation violations include absconding, possession of prohibited weapons, illegal narcotics, gang indicia, and new criminal violations. All 12 subjects were booked at the CMPD Jail and were later transported to the Orange County Jail.